When we first moved to the Lakeville area thirty years ago, a strange tree caught my eye along Townsend Road. The trunk grew upward a few feet, made a sharp 45-degree turn for a yard, then pointed straight up. In all my treks in the Michigan and Appalachian great outdoors, I’d never seen anything like that bent tree. Nearby, Stony Creek meandered in hairpin turns under Townsend and Brewer Roads. I’d look for the crooked tree in Townsend’s understory when I slowed to stop at the intersection. 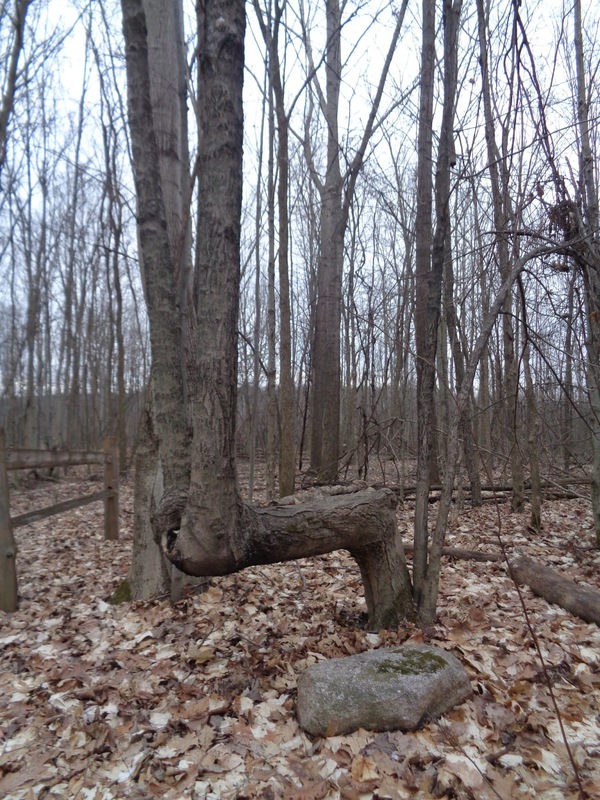 I seldom failed to wonder what deformed that tree. Several years later, I interviewed Mildred Schmidt, then Director of the Northeast Oakland Historical Museum. A charming octogenarian with a mind sharp as an ice pick, she told stories about Native Americans in our community. My favorite local historian solved my bent tree mystery. Natives bowed the trunk of a hardwood sapling and secured it with a band staked in the earth. At the band, they trained the trunk to grow upward. “Have you seen the trail marker on Townsend near Brewer?” Mildred asked. For years afterward I drove by Townsend’s trail tree and observed its decline and collapse. Out of sight, out of mind until my husband and I walked Leonard’s Polly Ann Trail last summer. Along the west side of the path, just north of Gerst Road, a huge bent tree pointed west. What a splendid reminder of Mildred’s lesson. After the leaves fell I asked Mel to hoist me up onto the horizontal trunk. I leaned against the oak and paid homage to Mildred—the woman who shared what she knew of the tribal people who left their mark on the land I’ve grown to love. I recalled my uncles’ stories about Daniel Boone passing through our Appalachian mountains, home of the Cherokee. I imagined Daniel followed the Cherokee’s bent oaks, maples, and elms from one hunting ground to another. Now I’m on a hunt for other Michigan trail markers. Daryl Bernard, Executive Director of Seven Ponds Nature Center, pointed me to a small, unmarked park of preserved oaks located off Lake Nepessing Road, north of Highway 69. Mel and I followed signs to the “Tree Horse”, the size of the former Townsend bent tree. Dear Reader, I talked with the Traverse City Welcome Center today. Two protected trail marker trees stand within their city limits. I’d like to visit with my new cross-country skis and check off two more trail trees from my “Things to See in 2019” list. Go from one hunting ground to another. Visit www.geatlakestrailtreesociety.org to learn more about Native American trail marker trees.